Forty-eight girls’ and boys’ teams in three classifications are practicing for the Idaho High School Activities Association’s state high school soccer tournaments Oct. 24-26 at fields in Meridian and Caldwell. It’s been 10 years since the Wood River Valley has produced a state soccer champion, that title coming for the Wood River High School boys and their coach Brian Daluiso in the 3A division back in 2003. It was Wood River’s third title, after victories in 1998 and 1999. The Wood River girls have boasted state championships in 1995 and 2000. And the Community School boys have won all the marbles four times in 1976, 1986, 1992 and 1999. A state championship has so far eluded the Community School girls—but this could be the year for the unbeaten Cutthroats (15-0-0) coached by Kelly Feldman. They brought home to Sun Valley the runner-up spoils last October, and the Cutthroats are full of hungry seniors. Beaten once in their last 31 games, the Cutthroat girls crack open their bid Thursday, Oct. 24 at 2 p.m. at Caldwell’s Vallivue High School against the Idaho Falls-area champ, the Shelley Russets (9-3-4). Shelley captured its second straight 6th District title 6-2 over Teton of Driggs. On the same side of the 3A girls’ bracket, also playing Thursday at 2 p.m., are Marsh Valley of Arimo and Bonners Ferry. Marsh Valley beat Shelley 2-1 for last year’s third-place state soccer. Bonners Ferry is the northern Idaho runner-up, having lost 3-0 in its title game to Coeur d’Alene Charter. Thursday’s 11 a.m. games feature two-time defending champion McCall-Donnelly (16-1-0) vs. Teton (7-8-3), and Coeur d’Alene Charter (12-3-3) vs. High Desert Soccer Conference runner-up Filer (13-4-1). 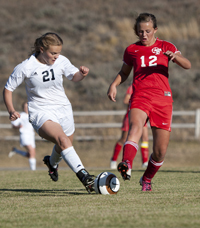 Five-time state winner McCall and Teton (2007) are the only teams in the field that have won State 3A soccer championships. McCall-Donnelly, a 2-1 winner over the Community School in last year’s title game, brings an eight-game winning streak and 12 shutouts into the 2013 tournament. The Cutthroats have 11 shutouts and have outscored opponents 95-4 en route to their 13th straight state tournament journey. If the two rivals meet again in the State 3A title game, it will be played Saturday at 10 a.m. at Middleton High School just west of Caldwell. The United Dairymen of Idaho is sponsoring the three-day tournaments that will decide the top Gem State soccer teams for 2013. At state, trophies are awarded to the championship, runner-up, third- and fourth-place teams. Medals are also given to members of the championship and runner-up teams in all six tournaments. The most wide-open tournament this weekend may be the State 4A boys’ meet, since only three of the eight teams from last year’s tournament are back for another attempt. Wood River, last year’s third-place winner 2-1 over Middleton, is one of them with coach Luis Monjaras bringing back his Wolverines to state for the fourth time in five years. And Wood River is the highest finishing team from last year’s tournament in the field. The two teams in last year’s championship game aren’t returning, so there will be a brand-new winner. Eight-time winner Sandpoint is gone, and previous champions Kuna, Skyview, Bonneville and Blackfoot aren’t in the field. Sandpoint beat Skyview 3-2 in last year’s title game, but the Lakeland Hawks shocked Sandpoint with its 12 seniors in a pulsating 7-6 penalty kick shootout after scoreless play in regulation time. It was also unexpected that the Emmett boys won their first 3rd District 4A title rallying from a late 3-1 deficit to beat favored Caldwell 4-3 in double overtime. Emmett will make its first state trip since 2004. Wood River (10-3-4) opens against Emmett (10-7-2) Thursday at 2 p.m., with eastern Idaho champion Preston playing Mountain Home (13-5-2) at the same time in a match-up of two teams not at state in 2012. On the other side of the 4A boys’ bracket playing at 11 a.m. Thursday are Jerome (14-4-0) vs. Caldwell (13-4-2), and Lakeland (6-11-2) vs. Century. The 4A boys’ state championship game is scheduled for Saturday at 7 p.m. at Middleton High School. The Wood River girls (11-5-1) coached by Jenni Conrad have the toughest opening-round match-up of all. They’ve drawn three-time defending champion Bishop Kelly of Boise (18-0-1) for Thursday’s 2 p.m. game on the Brothers Park pitch. The Knights are unbeaten in 87 consecutive games and have won five State 4A titles in six seasons. Only Bishop Kelly, Sandpoint (5 titles) and Century of Pocatello (3 titles) have won State 4A girls’ championships since the IHSAA started sanctioning the tournament in 2000. Twin Falls (12-4-1) vs. Middleton (13-3-3) and Sandpoint (10-3-4) vs. Blackfoot at 11 a.m.; and Century vs. Columbia (10-7-3) at 2 p.m. Blackfoot is making its first state visit in eight years, and Columbia of Nampa is back for the first time in five years after eliminating Skyview for the third Boise-area berth. If Wood River loses to Bishop Kelly, the Wolverines would next play Friday at 11 a.m., possibly against first-time opponent Columbia in a preliminary game before the probable Century-Bishop Kelly semi-final. Bishop Kelly defeated Century 2-0 in last year’s final. This year’s 4A girls’ final is set for Saturday at 4:30 p.m. at Middleton High School. Coach Richard Whitelaw’s Community School boys are back in the crapshoot known as the State 3A boys’ tournament. In 13 years of IHSAA sanctioning, 10 different teams have won the boys’ title with only Payette (3 titles) and Gooding (2) winning more than one. Last year Gooding (14-1-2) won its second title in four years 1-0 over Fruitland. Although five teams return from last year’s field, Fruitland isn’t one of them. In 2011, the last time the Cutthroat boys visited state, they beat Fruitland 2-1 (OT) for the consolation title. Gooding has a rematch with the Community School (13-4-2) in Thursday’s 2 p.m. game at Vallivue High School. The teams have met twice this season, host Gooding taking a 3-1 win Sept. 10, with the teams playing to a 2-2 draw Oct. 3 at Browning Field in Elkhorn. On the same side of the bracket, last year’s third-place Bonners Ferry plays once-beaten Sugar-Salem of Sugar city (15-1-0) at 2 p.m. Thursday. The 11 a.m. games feature American Falls vs. North Fremont of Ashton (5-8-1), and Weiser against last year‘s consolation champ Wendell (11-3-1). The 3A boys’ championship game is set for Saturday at 1 p.m. at Middleton High School.